Common Ravens are so bold, playful, and clever that they’re almost always doing something worth watching. They’re less gregarious than crows, often seen alone or in pairs that stay together year round, although many may gather at a carcass or landfill. 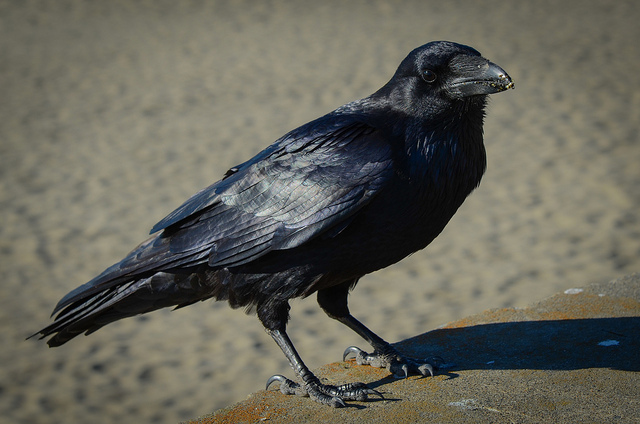 Large groups of ravens are probably young birds that have yet to pair up; ravens begin breeding at ages 2 to 4. On the ground ravens walk confidently, sometimes with a swagger, sometimes sidling. In flight they’re more graceful and agile than crows, which often appear to be swimming across the sky compared to a raven’s light wingbeats and occasional soaring. Ravens often perform aerobatics, including sudden rolls, wing-tucked dives, and playing with objects by dropping and catching them in midair.